PATAGONIA emphasizes recyclability and new, distinctive fabric patterns in their 2009 apparel and vest products. The overall line, in our opinion, looks sleeker and more up-to-date. But plenty of smart design changes lurk beneath the surface. The most interesting, in our opinion, come with the redesign of the venerable SST. Gone is the bomber-jacket feel of the SST of ten years ago and even the slightly heavy look of last year’s stretch-fabric version. Yvon Chouinard challenged his team to come up with a recyclable jacket that also improved on performance, and the new SST ($425) does just that. It features high-end non-corrosive waterproof zippers on the side pockets, and double-rip-stop Nylon 6 fabric — in part because of its abrasion resistance and because it doesn’t wet out as fast as the stretch fabric, but also because Nylon 6 is completely recyclable. The new SST also has new cuff designs and a single-pull hood that works from the back of the head (something from their alpine design team). In addition to a new Women’s Guidewater Jacket ($400) and a Shelled Insulator Jacket made of stretch-woven polyester ($275), Patagonia also has several new additions to the clothing line. Their new Guidewater shirt ($120), pants ($75) and shorts ($60) are hardier versions of the hot-weather line; the stretch-woven “dobby-weave” fabric is quite distinctive and more suitable for cooler climes. And the new Marlwalker pants ($85) and shorts ($70) are the first recycled and recyclable lightweight fishing pants in the company’s line (check out the new colors, including the “Blood Knot” print). A new fabric for the Sun Mask and new form-fitting Sun Gloves round out the offering. Finally, Patagonia has subtle but clever design changes in place for their Pack Vest ($180), Double Haul ($130), and Hip Chest Pack ($70). Redington continues their tradition of offering mid-priced outwear that steals the thunder from other top-end lines. 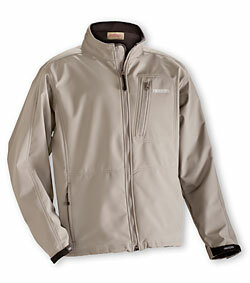 And this year their new jackets, fleeces, softshells, shirts and pants show a new level of design sophistication. Their new CPX (“Core Performance”) stretch-woven Softshell Jacket fabric is both water and wind repellant and will be used in a new jacket ($150), vest ($90) and pant ($100). We particularly liked the idea of high-wicking pants that could double as both steetwear and under-wader-wear. The company’s new Barrier Island Rain Jacket ($65) offers a 100% waterproof PVC-free option for the budget-conscious. And the Yukon River Fleece ($75) is a non-piling fleece jacket with a chest utility pocket in addition to hand-warmer pockets. Finally Redington will add high-wicking Campbell River Polos ($40-45) and lightweight Slipstream Shirts ($40-50) to their offering. Both offer UPF 30+ sun protection. For 2009, Simms is utilizing a brand new finish process in their sportswear collection. The exclusive COR3 Technology fabric finish has a UPF rating of 30+, anti-microbial properties, and outstanding wicking performance. Especially in warmer conditions, we think the new finish will be an improvement over last year’s 3XDry finish but still provide the same level of comfort. The new finish is applied across a full range of pants, shorts and shirts. In jackets and vests, Simms will provide new color options for the G4 Pro Jacket and has updated the best-selling G3 Guide Jacket as well as their award-winning vests. Simms also updated their award-winning fishing vests with new finishes and fabrics for 2009. ExOfficio launched their new apparel product lines this summer with the introduction of the Amphi, Roughian and Explorer collections (think durability and high-wicking), and the Seek’r and Trip’r collections (think lightweight travel clothes). At the show, we saw their new Nio Amphi convertible pants ($80, left) and Neptune long-sleeve crew ($54) — a Sun Guard 30+ and Nanoplex treated knit top — both part of the Amphi line. And we still think their Give-NGo™ underwear is one of the best things going. Cloudveil is offering a new Hellroaring Jacket ($200), a softshell jacket with asymmetrical cuffs, high-set handwarmer pockets, and a big “game” pocket in the back. The new highly water-resistant fabric is quite a bit smoother than standard fleece and features a 100-wash rating. 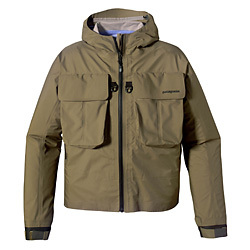 Fishpond continues delivering innovative color and functional combinations in fly fishing vests for 2009. Their Firefly Women’s Fishing Vest is hands-down the most appealing fishing vest for female anglers (we polled the most fashion-conscious women we could find in 48 hours) and this year comes in a new color, Mountain Thistle. Among its new apparel, Orvis has an attractive new Stretch Wind Pro Fleece jacket ($159) that offers 4-way stretch and a welded chest pocket and comes in gray and a bright orange. 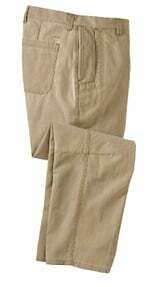 We also liked the look of their new dark khaki Trout Bum River Pants ($119), which are nylon fabric but sport a retro look. In January 2009 Buff will be bringing out a line of facemasks with “Insect Shield technology.” According to the company, “The Insect Shield lasts over 70 washings and is made from a natural insect repellent found in certain chrysanthemum plants, such as the African Daisy.” If you fish buggy places, you know biting insects have an uncanny knack for finding chinks in your armor. You also know that there aren’t many alternatives to smearing your face with potent chemicals for protection. We’re guessing a lot of fishermen who’ve made the switch to covering up for sun protection will also be curious about what kind of bug protection can be delivered in a facemask, especially if they’ve been fishing in the Everglades or Newfoundland on a midsummer day. The new UV Buff with Insect Shield will retail for $27. It’s also worth noting that beginning in January 2009, all Buff products will have a polygiene active odor control treatment.